My left leg is about 4cm longer than my right. My lower back has slight curvature. I don’t have any proper ball and socket joints in my shoulders or hips. My walking gait is severely compromised. All of my life I have been unable to walk very far (about half a mile maximum before I need to stop and rest). Of course, none of this helps with weight and my being able to exercise. 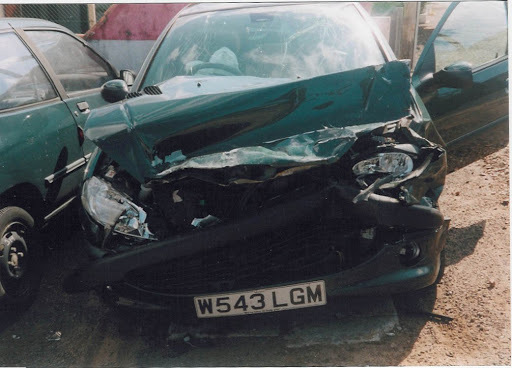 In 2002 whilst I was on holiday in France, I set off on the wrong side of the road (driving) and had a head on collision with a car coming towards me. Although we both braked and took avoiding action, we met in the centre of the road. The force of the crash was so bad, it fractured my right ankle (through the accellerator pedal) and my car was written off. My daughter (the aged 5) and my then husband were both also injured – my daughter my the force of the seatbelt on her collar bone and hip, and my ex husband (because me put his left arm out and braced himself) injured his left wrist and ankle. Thankfully neither of their injuries were severe. I had to have immediate surgery to plate and pin my right tibia and fibula. Our holiday was… urrrm, extended (shall we say) and I was flown back to the UK on a private plane (thanks to the holiday insurance company). I couldn’t walk as I couldn’t use crutches (because of my shortened arms). I was forced to use a wheelchair outside of the house so that I wasn’t housebound. I had my (new) car adapted with a wheelchair hoist to accommodate my powered wheelchair. My right ankle never healed. Although it wasn’t (prior to the accident) affected by my disability, it failed to regain it’s full movement/mobility and I was in constant pain. Despite physio, my ankle was swollen all of the time. I’d be forced to go upstairs to bed at 6pm just to elevate my ankle and try and reduce the swelling. About 8 months after the accident and with no improvement and after getting a second opinion from a ankle/foot specialist, I had further surgery – an arthrodesis. They remove all the cartilage from all parts of the joint and pin all the bones of the ankle to permanently fuse the joint in (approx) 50 degree angle from the leg. The aim was to get rid of the pain and to prevent any more arthritis setting into the joint (my ankle bones were all moving out of position). Sadly the ankle isn’t that much changed – I still have pain, it’s still swollen…. I can’t walk even one step without severe pain. I use a powered wheelchair when outside of my house, but it’s kept in the car. I can manage to walk around the house and I can manage stairs with extreme difficulty (I come down in the morning and go up at night). So…. back to exercise and my HRM… the treadmill…. walking…..
I’ve been swimming once a week for about 8 months now. I go and swim for an hour on my back (can’t swim on my front because of my short arms and arthritic neck). I wear swimming fins (shortened flippers) which help me move through the water but also provide greater resistence so my legs/ankles have to work harder to power me through the water. BUT I wanted something to help me with cardio vascular exercise. A week ago, I borrowed my ex husbands treadmill with a view to being able to start exercising regularly. Bear in mind, I’ve not walked for 10 years (in the proper sense of the word). I know because of the weight loss that my fitness has already improved. I don’t feel as if I’m having a heart attack when I over exert myself now! My asthma seems to have vanished. I planned to start by walking quarter of a mile. However, on my first attempt, I walked half a mile. I did this at a slow pace (1.7 mph) and I had to stop every five minutes. But I did it. I have been visiting a personal trainer (one assessment, one session last Friday), because I recognize that I need to make sure I don’t overdo it. And I bought my HRM because I wanted to monitor any improvements in my fitness levels and ensure that I was giving my heart a really good work out. Today I’ve done 20 minutes (with two stops, not letting my HR return to less than 120 bpm). It took me 29 minutes (20 mins walking, 9 mins resting), my average speed was 1.7mph. My average heart rate during the session was 140bpm, the highest it got to was 159. My HRM tells me I burned 390 calories. Regular 20 minute walking on treadmill would have earned me 53 calories. So – purpose of this post is to (1) encourage EVERYONE to try and do some form of exercise and (2) to encourage people to use HRM’s to give themselves a more accurate idea of just how hard – or not – they are working themselves. I kind of thought I was burning a lot more than an on-line exercise calorie calculator tool on the weightloss website site was giving me, but I hadn’t realized that the difference would be quite so mammoth!!! 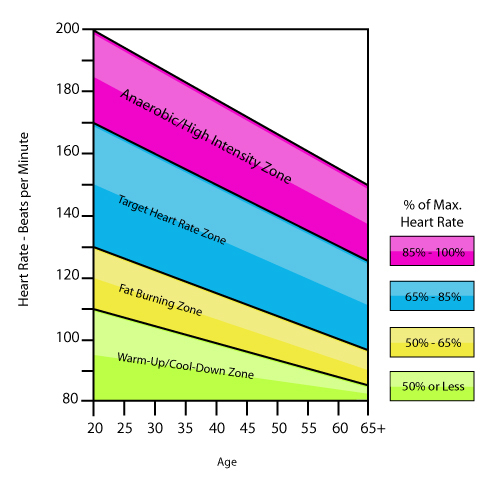 The Target Heart Rate Zone (65-85% of Maximum Heart Rate) is an area of moderate intensity activity that leads to improvements in your aerobic capacity and burns fat. This zone provides many benefits for all fitness levels, including those who want to lose weight, those who are training for an athletic event, or those who are looking to have more energy and get fit. Exercising below this zone (50-65% of Maximum Heart Rate) is the Fat Burning Zone, because at this intensity, fat is metabolized for energy use at a higher rate. This intensity is often recommended to individuals who are extremely de-conditioned or new to exercising. While the name of this zone leads you believe that you will burn more fat at this zone, there is less cardiovascular (heart) benefit at this zone and less overall caloric burn. Again, if you are de-conditioned, have a heart or respiratory disease, or are new to exercising this would be an appropriate zone for you. The High Intensity/Anaerobic Zone (85-100% of Max Heart Rate) is recommended for highly fit individuals, such as athletes. This zone places a high demand on the cardiovascular system and does not burn much fat. Individuals may use this zone as part of “interval training”, where your heart rate reaches the High Intensity Zone for a short period (less than 60 seconds) and is allowed to recover to the Target Heart Rate Zone (65-85% of Max Heart Rate) for a period of time (60 seconds to 4 minutes). Always remember to start each exercise session with an easy warm-up. You can use a heart rate zone of less than 50% of Max Heart Rate to guide your warm-up. As a general guideline, a warm-up can be something as simple as walking for 5 to 10 minutes or just a slower version of the exercise you are going to perform. Additionally, take 5-10 minutes after your exercise to do a cool-down. Slow down your movement, stretch and try to get your heart rate back down to less than 50% of Max Heart Rate.